Here's a neat little ditty you can easily slip into your bag of tricks. 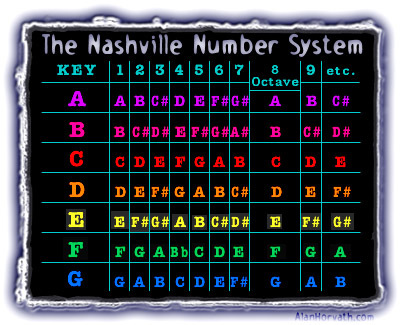 The Nashville Number System is a very easy reference tool, created in Nashville (duh! ), by some studio cats, no doubt. I imagine what occurred was, the need to try a number of different keys on any given song, in any given session, was the Mother of Invention here. I could be way off on that, but I'm stickin' to it until someone informs me otherwise. Anyone who has studied the slightest amount of music theory, chord structures, and/or harmony, understands the numerical theory behind the Nashville System. For example, the "3rd" in a C chord is an E note; using the root (C) as the number one, and counting sequencially upwards ... C = 1, D = 2, and E = 3 ... we know that to play a "3rd over a C," means to play an E note. Naturally, the "3rd" in an E chord (E/1, F/2, G/3) is G# ... because, of course, a G in the E Major scale is always sharp - you knew that ... right? No matter -- you can just use my chart (below) and skip all that stuff. So, what happens is, you're playin' with a bunch of Nashville dudes, see? They're cuttin' this song, and the big-shot says, "progression is 1, 4, 5 ... the chorus goes: 4, 5, 6minor - three times; fourth time, it goes 4, 5, 1." What do you do? You go, "what key is it in?" 'Course, you should be able to figure that out by a quick listen, and a tap or two on your guitar ... but even if you don't, someone's bound to think you're just lazy, and blurt out, "It's in G, man!" So, okay ... big deal. You can count! You know the song goes G, C, D ... exept in the chorus, which goes C, D, Em - three times, and then C, D, G the fourth time. The cool thing about it, is when the vocalist arrives and he/she can't sing in the key of G! ... it has to be in the key of D! Nothing changes. The progression is still 1, 4, 5, etc. -- only now you're starting from D as #1 and counting. So, now we're gonna play D, G, A ... and the chorus goes G, A, Bm - three times; fourth time is G, A, D. Pretty simple, huh? Everybody can do their private math, quietly, and, in ten minutes when the tape starts to roll, everybody sounds like they knew what was up all the time. The vocalist is very impressed! And, most of all, the guy cutting the checks is smiling. If you need more about this, a good pal of mine wrote a book you can get at Amazon.Com ... Just click above. Alan Horvath has been writing songs, performing, and recording as an acoustic rock artist for many moons.